Philadelphiachromosome-negative chronic myeloproliferative disorders (CMPDs) include polycythemia vera (PV), essential thrombocythemia (ET) and primary myelofibrosis (PMF), subsumed as the “classic CMPDs”, as well as the following disorders: chronic neutrophilic leukemia (CNL), chronic eosinophilic leukemia (CEL) and the hypereosinophilic syndrome (HES), clonal basophilic disorders and unclassifiable CMPDs. The diagnosis and management of CMPDs has been difficult in the past due to several reasons. (1) Significant phenotypic mimicry exists among classic CMPDs on the one hand, as well as between classic CMPDs and non-clonal benign and malignant hematopoietic disorders on the other hand. 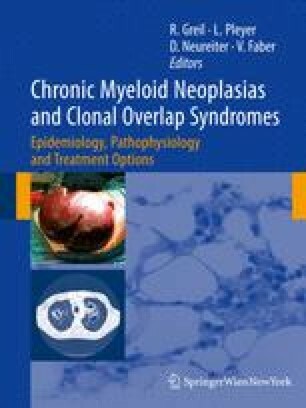 (2) The initial lack of clonal molecular diagnostic markers in the pre-JAK2 era, as well as the previous lack of clear-cut diagnostic criteria and an adequate classification system, has often led to misclassification of chronic myeloproliferative disorders.